A full house came to hear Amanda Swinimer, founder of Dakini Tidal Wilds, tell Metchosinites about seaweeds. She gave the audience a global perspective and provided insights on local harvesting and use. 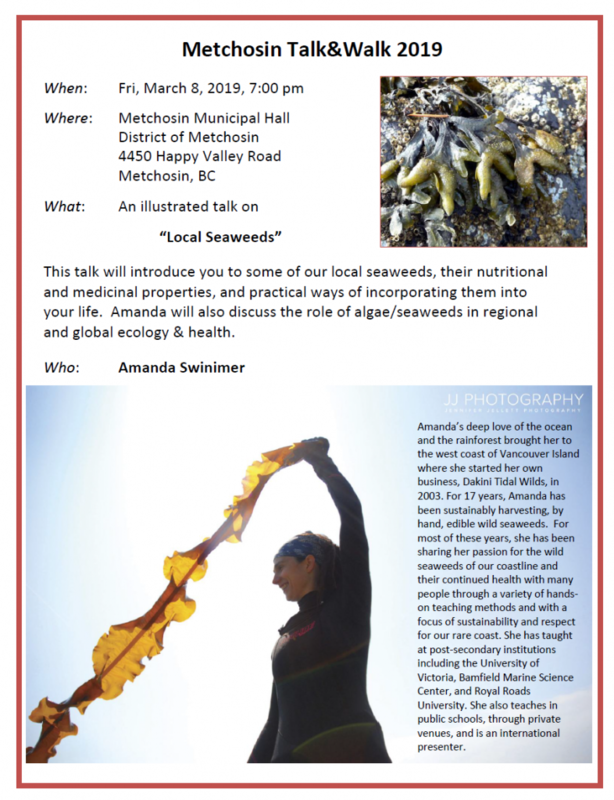 Join us on Friday, March 8 to hear our local selkie, Amanda Swinimer of Dakini Tidal Wilds, talk about seaweeds. When we hike among the cedars at Goldstream Park, our minds are more on botany than on zoology. The majestic trees, however, are direct products of the salmon stream running through the park. 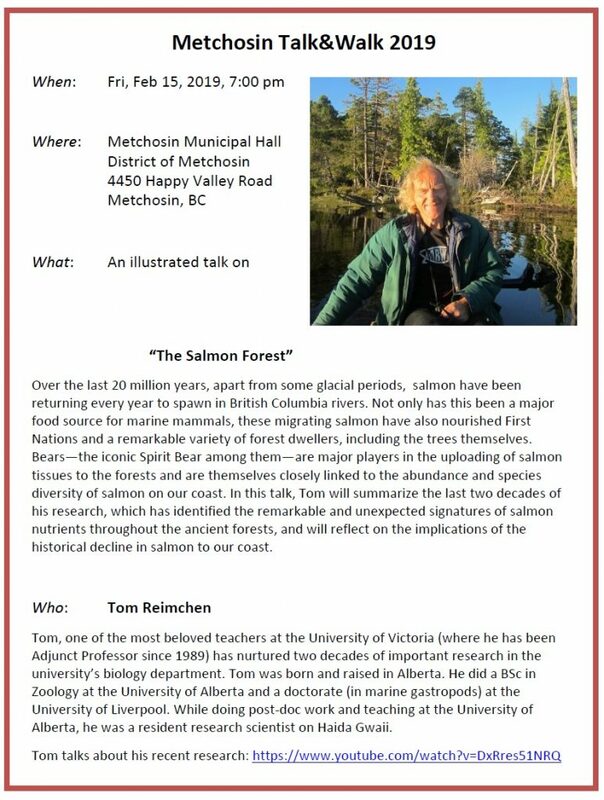 Professor Tom Reichen, a popular teacher/researcher at the University of Victoria and our next guest (Friday, February 15) at the Metchosin Talk and Walk series, will tell us about “The Salmon Forest.” See poster below. There will not be a walk on the Saturday following Tom’s talk. Keep Friday, March 8, open on your calendar. You’ll want to hear our nearest selkie, Amanda Swinimer of Dakini Tidal Wilds, talk about seaweeds. 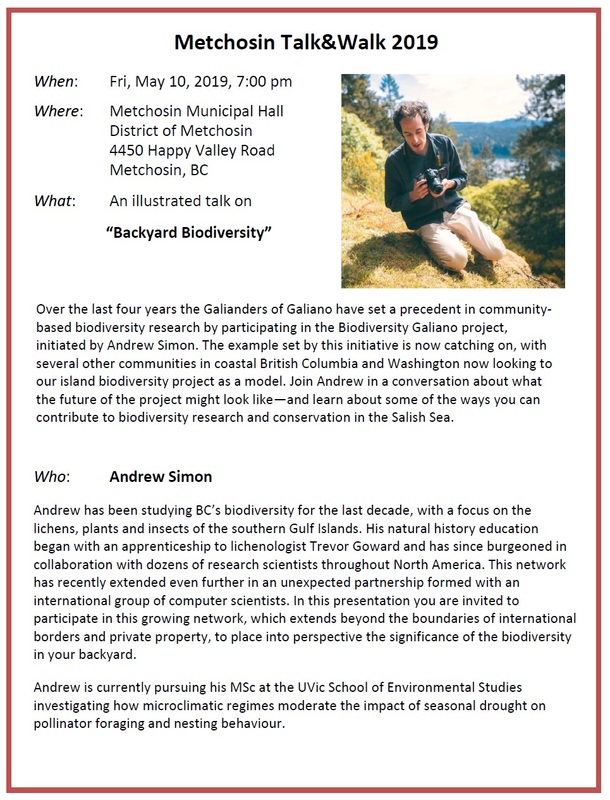 See the Talk and Walk web page for more information on upcoming talks. 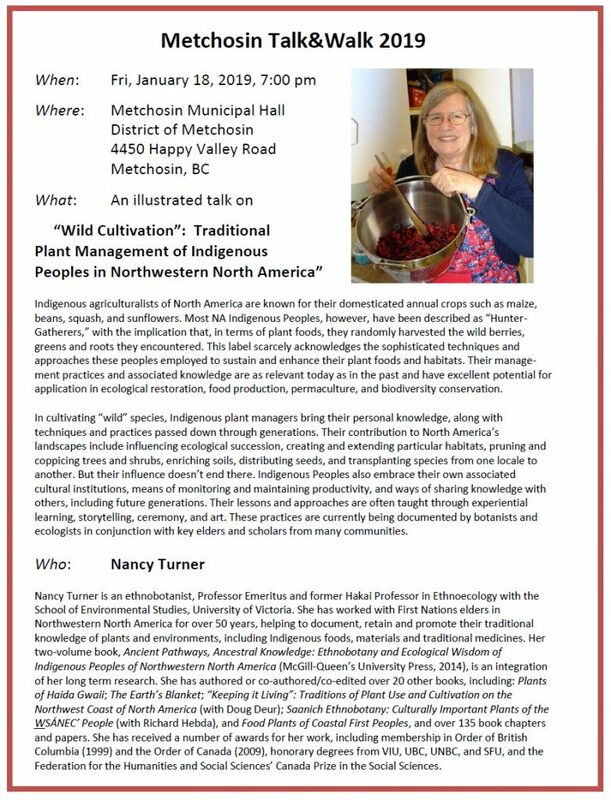 Many of those who attended Nancy Turners talk on “Wild Cultivation” asked for a copy of her slides. Nancy has generously agreed to share them with us. Click on the accompanying image to view the PDF-formatted slides. 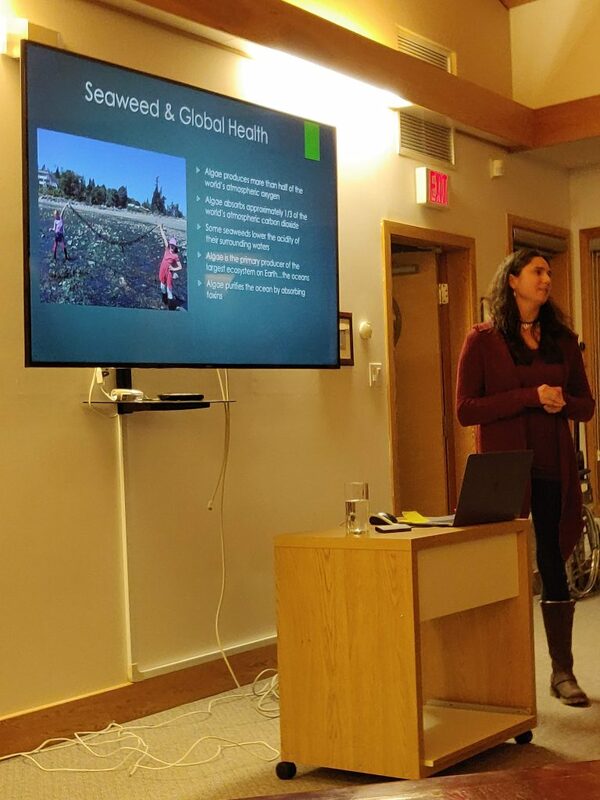 Nancy Turner came to our Talk and Walk in January 2019 and shared with us some of her ethnobotanical work on first nations technology and practice. Below is a video of Nancy prepared by Hakai. In it, Nancy talks about our native sword fern. 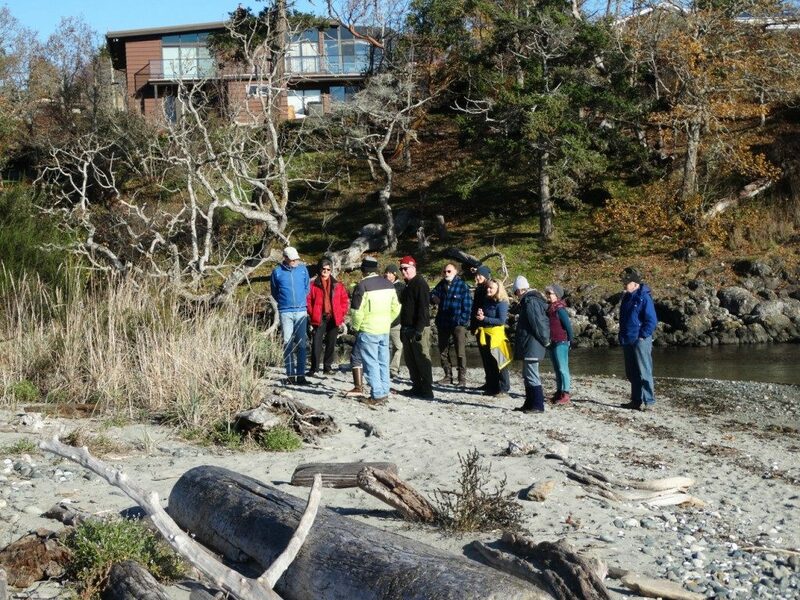 On Saturday, Metchosin’s own ethnobotanist, Fiona Hamersley-Chambers (a graduate student of Nancy’s), led a walk along high-tide Witty’s beach. Two dozen people turned out to see the evidence of indigenous land management pointed out by Fiona. Nancy Turner is a living legend in our area. 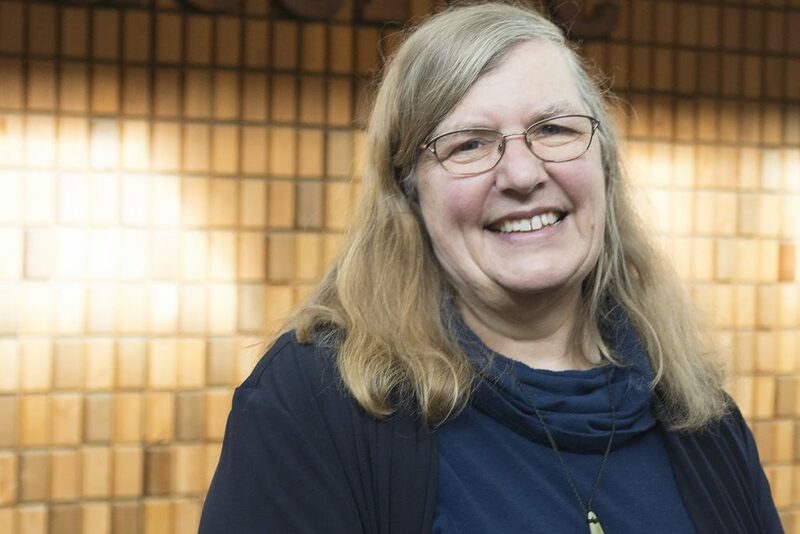 Her work on indigenous botany and traditional knowledge has helped all of us to understand how to relate to the BC environment and the BC first nations. 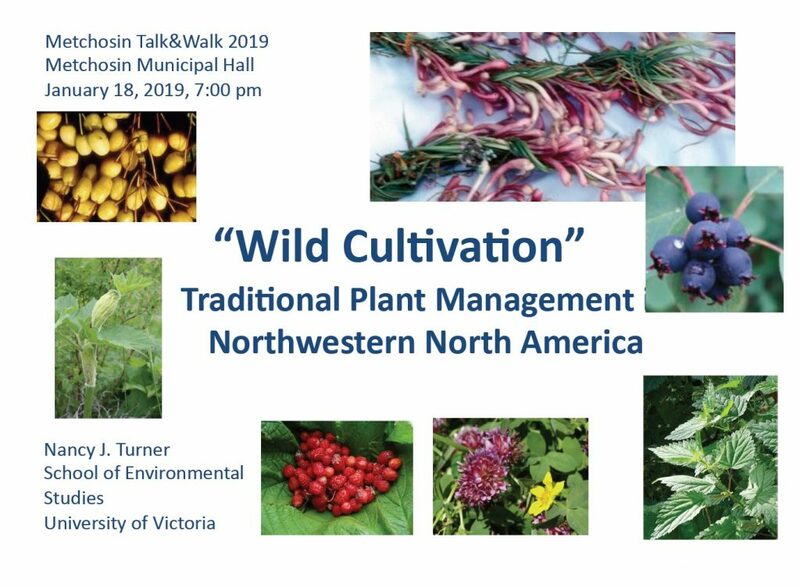 Nancy has graciously agreed to come to Metchosin on Friday, January 18, to talk about traditional plant management as part of the Talk and Walk series. Please join us if you can (and come early if you want a seat). Pippi Lawn gave a great talk on Friday night. 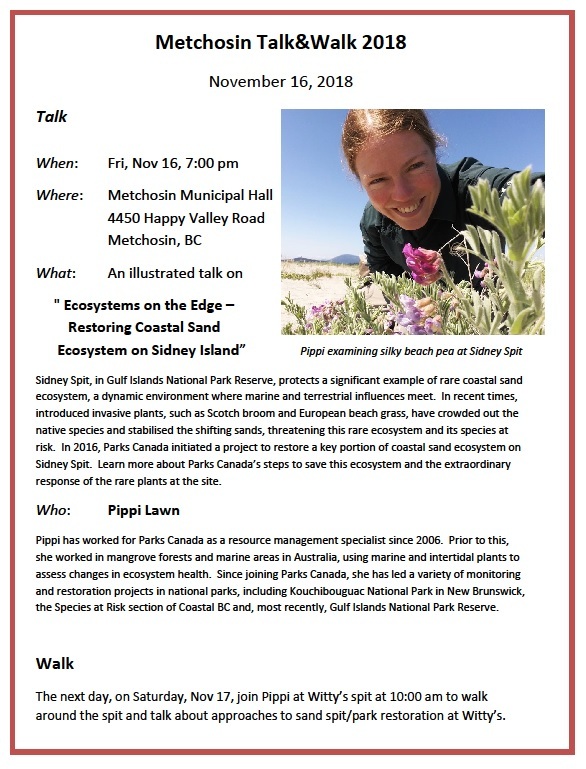 She reviewed the work that she and her teams had done on Sidney spit, restoring native plants. On Saturday morning (Nov 17) a large group showed up at the end of Witty’s Lagoon Road to join Pippi for a walk around Witty’s spit. Pippi talked about some of the lessons learned–both positive and negative–during the Sidney Spit restoration. 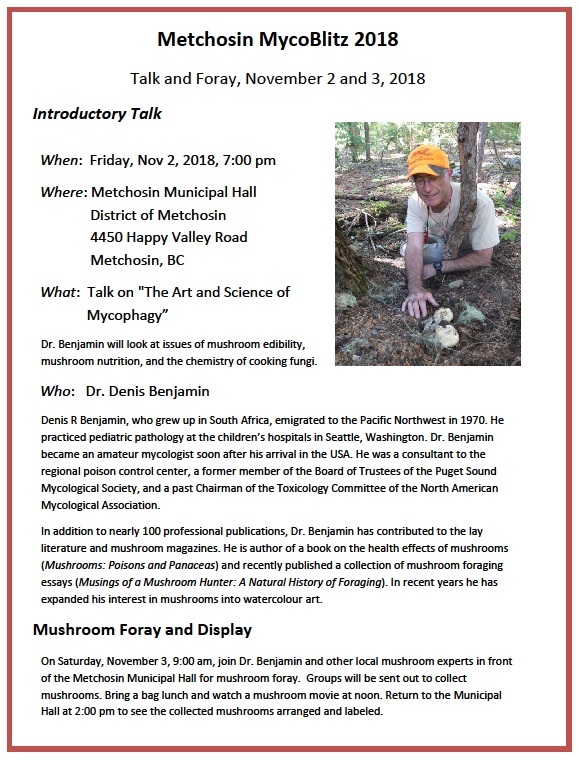 Welcome to the Metchosin Talk and Walk website. Until the fall of 2018, the Talk and Walks (102 of them over a twelve-year period) were organized by Moralea Milne. 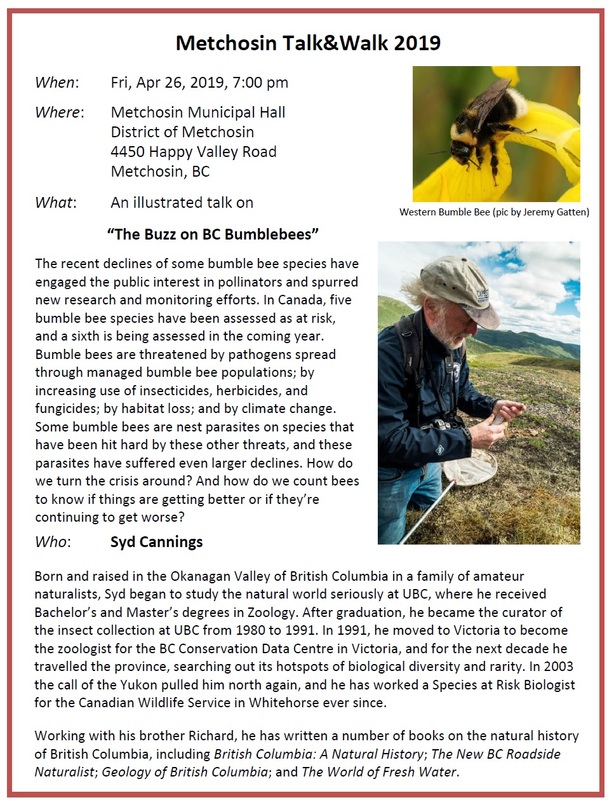 Since then, the Metchosin Biodiversity Project, which Moralea helped to start and which runs the Metchosin BioBlitzes and MycoBlitzes, has been organizing the Talk and Walk series. Click here to view a list of all the talk and walks speakers to date. September 6: Leah Ramsay, Dragonflies.